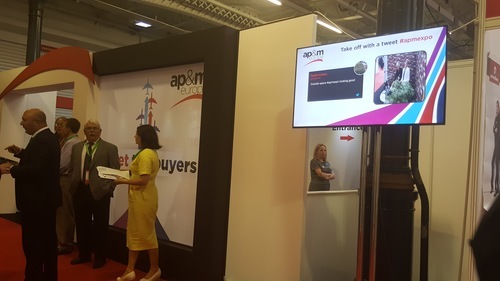 EventBeat was approached by AP&M to power the screens at the annual MRO Procurement Exhibition held at Olympia, London. The AP&M Expo event congregates over 200 suppliers of the airline supply chain under one roof and is attended by over 3,000 aviation professionals. Due to the large number of visitors and stalls, AP&M wished to manage the crowd by creating a system of advertisements and announcements that could update dynamically throughout the exhibition, informing and directing visitors to what was going on. EventBeat utilised the NowSignage app technology to stream content to each screen. The team downloaded the NowSignage app onto Amazon FireStick media players and connected them to the HMDI ports of each screen. The FireStick device has several advantages over traditional cloud based signage, principally the 8GB of storage, dual-core processor and support of 1080p HD resolution. Content is downloaded via the cloud and stored locally on the device meaning that even if the internet connection is lost, as often happens at large scale events, the content keeps playing in pixel perfect rendition. The NowSignage app has provided AP&M with a centralised facility to run and manage its screens remotely. The EventBeat team gave training in the new software to AP&M staff as well as provided an onsite network management service, logging in to monitor the content and checking there were no connectivity issues.